Like the majority of server systems you will install your SSL certificate on the same server or keystore where your Certificate Signing Request (CSR) was created. Your private key will always be left on and inside the server system and keystore where the CSR was originally created. Your SSL certificate will not work without original keystore file. We will assume that this is the original system. JBoss is a very customization environment below are generalized instructions, you will have to adapt these instructions to your own environment. If you lose your keystore file or your password to access it. your SSL Certificate will no longer match and you will need to replace the certificate. In order to install your X509 SSL certificate and its CA intermediate into your keystore JBoss Tomcat system perform the following steps. It is recommended that you have your Keystore, SSL certificate and Keytool.exe in the same folder or you will need to specify the full file path when running the following commands. you may want to make a copy of your Keystore in case their are issues with Installation. Viewing the contents of the keystore. The end entity SSL certificate is imported into the alias with the “Entry Type” of PrivateKeyEntry or KeyEntry. If not, import the certificate into the Private Key alias. 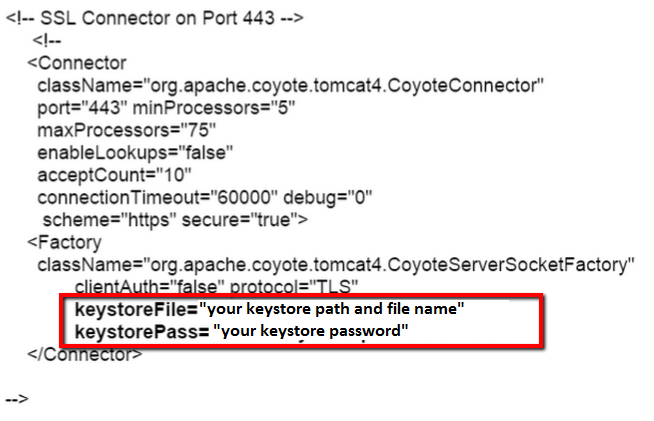 JBoss Tomcat keeps its configuration information in a server.xml file, which ensures JBoss is reading the correct keystore file and keystore password.This file also allows server administrators to set the port for secure connections. If the server.xml file is not configured, or if it is pointing to the wrong keystore, then the server may present the incorrect certificate to the client browser. Note: JBoss can be a custom environment. The name of your server.xml file could be something different. You should see some sort of connector within a .xml file under JBoss in the example below. This is what needs to be configured. If you are unable to figure or discover this SSL Connecter you may have to contact JBoss Support. On the Jboss Tomcat server search and open the Tomcat server.xml file. Search for the secure element in your config file (try searching for SSL Connector). Your keystore file name and path is listed under KeystoreFile, and its Password is under keystorePass. A: Standard Tomcat Systems server.xml using .jks keystores.. If your Server.xml file looks like the above then perform the following conversion using Keytool on the Tomcat system. Note: below the naming conversions are generalized. your names will differ. After this conversion you will have a new .jks keystore that can be used to specify to the keystore file path and directory. Make sure to specify the correct “keystoreFile” directive to the new keystore and the “keystorePass” directive is referencing the correct keystore password. Note: These directives are case-sensitive! Make sure the letters “F” and “P” in “keystoreFile” and “keystorePass” are in uppercase. Note: If your keystore contains more than one private key alias, please add the “keyAlias” directive to reference the correct private key alias name. Usually only seen in some standard Tomcat systems that use .jks keystores. B: Tomcat Systems server.xml able to use .pfx keystores.. If your Server.xml file looks like the blow example then no need for a conversion your version of tomcat has the capability of using .pfx files. After you have figured out what type of keystore your server.xml file requires you are then ready to make the server.xml file point to your .pfx keystore. Your SSL/TLS certificate is now installed and configured for its website.